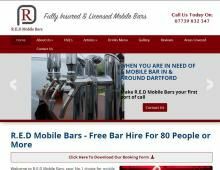 R.E.D Mobile Bars are fully insured and licensed mobile bars covering Kent, Surrey, Sussex, Essex & London.Offering free mobile bar hire in Kent with an extensive bar menu that includes wines, beers, spirits and soft drinks. Hire R.E.D Mobile Bars and enjoy a great selection of beers, ciders, wines and spirits for your event or celebration from their mobile bar service in Kent. If you are holding a larger event with more than 80 guests R.E.D Mobile Bars can offer you free bar hire in Kent. Whether you need mobile bar hire for a couple of hours or a couple of days R.E.D Mobile Bars can help, they have a great reputation locally and provide full bar set up for your indoor or outdoor event. R.E.D Mobile bars provide a fully stocked, licensed bar at a very affordable price. Wedding drink prices are affordable too, all served by experienced staff. Contact R.E.D Mobile Bars for a free quote today. Call R.E.D Mobile Bars, Dartford, today to book a mobile bar in Kent or wedding bar hire in Kent, London or Surrey.